The edge-on protostellar disk, herbig Haro 30 Planetary systems originate in the circumstellar accretion disks that form during starbirth. Initially, those disks are heavily gas-rich, with the gas clearing and dissipating over a period of 5-15 Myrs. In the early years, the disks are optically thick, and capable of obscuring the central star if viewed at the appropriate geometry (along the disk). With the bright central source hidden, these edge-on systems offer the prospect of examining the detailed vertical structure of the disk, probing the physics of grain formation. Jets and nebular structure become visible, revealing the roles played by accretion and shocks. The present proposal targets 15 edge-on protostellar systems, discovered through either HST or ground-based observations. These systems will be observed using both WFPC2 and NICMOS, and the observatoins combined to investigate the early evolution of protoplanetary disks. 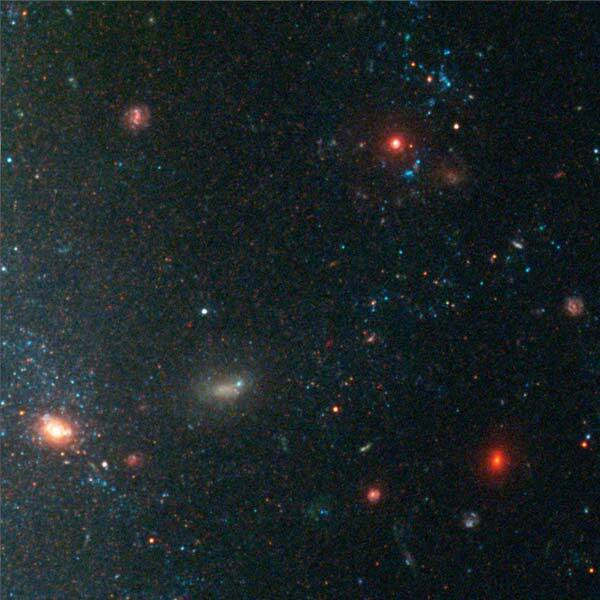 Red galaxies in a portion of the Hubble Deep Field Determining the initial epoch of galaxy formation remains a key question for cosmology and galaxy evolution. As recently as a decade ago, the standard cosmological models predicted that most galaxies were expected to form at relatively modest redshifts, between z~1 and z~2. 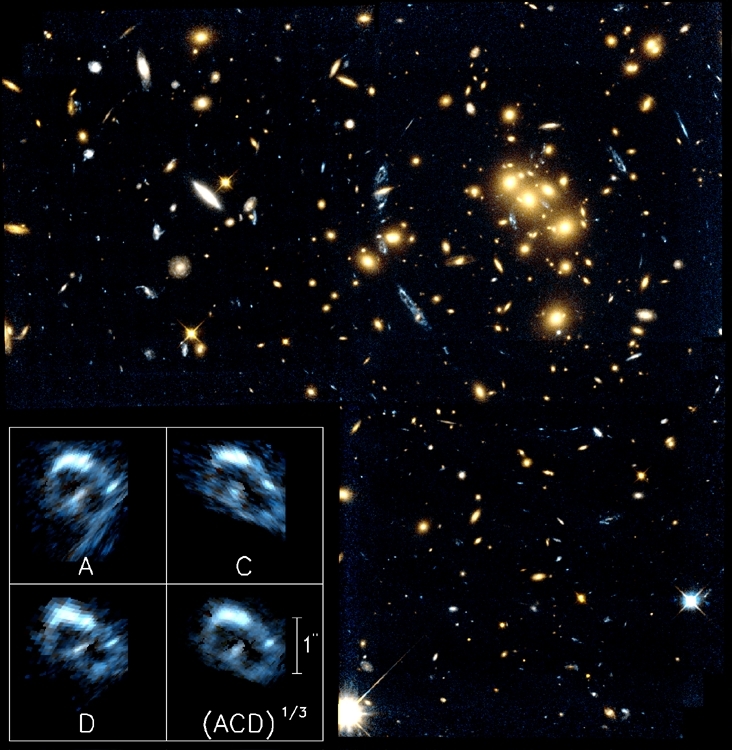 However, deeper and deeper observations, particularly the Hubble Deep Field images, showed that many galaxies at those redshifts were surprisingly mature, with little evidence for extensive ongoing star formation. These results prompted further investigations, including multicolour photometric observations and low-resolution spectroscopy, providing spectral energy distributions that could be matched against stellar populaton models, and high angular-resolution images (mainly with HST), probing the detailed structure of these systems. The current program specifically targets luminous (massive) red galaxies with redshifts z~2.5, which are suspected of being progenitors of modern-day massive ellipticals. The detailed morphologies of these galaxies will be studied using the NICMOIS NIC2 camera. WFPC2 image of gravitational lensing by the cluster, 0024+1654 Gravitational lensing is a consequence of general relativity. The effects were originally quantified by Einstein himself in the mid-1920s, and Fritz Zwicky was the first to suggest that those effects may even be observable if a galaxy were to act as the lens. Actual detection had to almost half a century, until the discovery of the double quasar, Q0957+561, by Walsh, Weymann & Carswell in 1979. Lensing leads to light amplification, that is, lensed objects are brighter; consequently, high redshift objects can be amplfied to the point where they become accessible to spectropic studies, allowing astronoemrs to probe details of the early universe. Many examples of this phenomenom are now known, both due to compact lenses (stars, QSOs, black holes) and to galaxies and galaxy clusters. The Sloan Digital Sky Survey (SDSS) has proven an especially productive source. The SDSS ground-based images, however, are not of sufficient resolution to either confirm candidates objects as lenses, or fully resolve the individual components in most systems. The aim of the present Snapshot program, originally undertaken with ACS and now pursued with WFPC2, is to use the unparalleled resolution of the HST at optical wavelength to confirm (or reject) the SDSS candidates. Artist's impression of an extrasolar planetary system The overwhelming majority of extrasolar planetary systems have been identified through radial velocity monitoring, and the detection of the reflex motion of the parent star as it orbits the common center of mass of the system. Just as radial velocities measure the stellar "wobble" introduced along the line of sight, so high precision astrometry can be used to measure motion in the plane of the sky. Combining these data gives the full three-dimensional motions of the system, and a direct measure of the mass of the planetary companion. The Fine Guidance Sensors on HST are the only system currently capable of making observations at the required sub-milliarcscond accuracy, and has already been used for astrometry of four systems, including the M dwarf Gl 876, which has an entourage of at least three planetary-mass companions. The current GO program pursues observations of six planetary hosts, and FGS observations of one targets, HD 136118, are scheduled over the next two weeks.